In this social game of hidden roles and deduction, players are divided into 2 different rooms. Find your teammates, establish trust, and exchange hostages before time runs out and the bomb explodes! It's the party game that's always a blast. Only minutes to play! Strategy, socialization, and intrigue within a time limit. Over 70 unique 100% plastic character cards! Everyone can be different! No moderator necessary. Everyone gets to play! Share your card with others to prove your loyalty. Make friends, not enemies. Includes all the Kickstarter stretch goals! All Advanced Character Cards from the Kickstarter campaign. This game contains over 70 unique 100% plastic character cards! Think you've found a secret card? 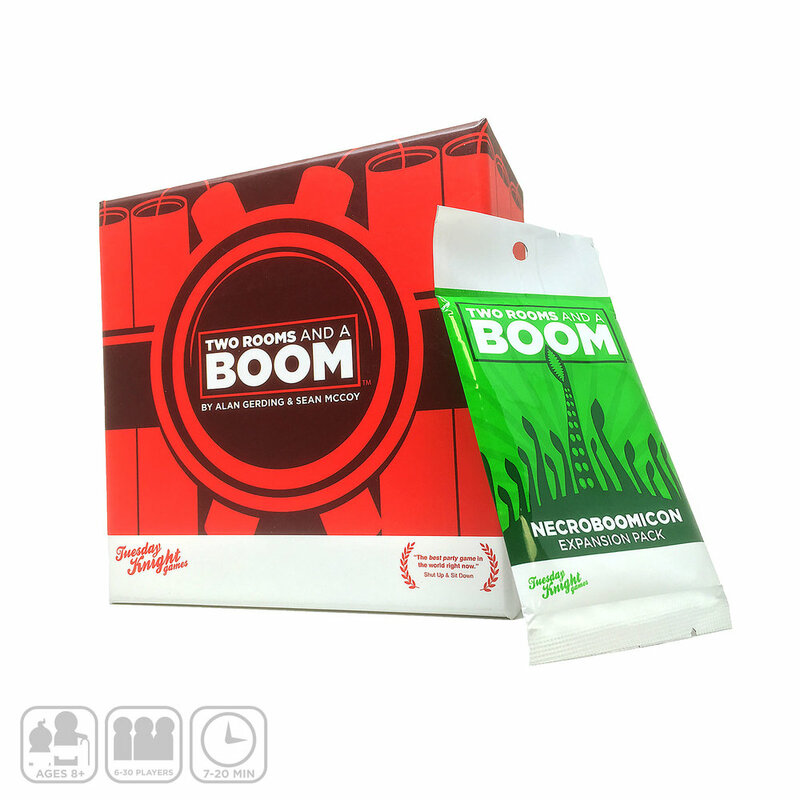 Necroboomicon is the first expansion to Two Rooms and a Boom, the party game that is always a blast. Think of it as Two Rooms and a Boom on HARD MODE! 10 All-New terrifying Character Cards inspired by the master of horror, H.P. Lovecraft. Enhanced tension and play for seasoned Boomers. Introduces and encourages color sharing when playing with fewer than 11 players. Specifically designed to make Two Rooms just as fun with few players. Only have 6 players? NO PROBLEM! Check out our awesome new Necroboomicon themed playsets! 2 separate rooms) and then each player is randomly dealt a facedown character card. The game ends after the last hostage exchange. Everyone reveals their card. If Red Team’s Bomber is in the same room as the President, then the Red Team wins. Otherwise the Blue Team wins. Feel like your countdown is missing a little pizzaz? Well, we've got just the thing - custom countdown timers by our illustrious team of musicians. Countdown in style with these bad boys. Just got your copy of Two Rooms and a Boom and don't know how to put together a great playset? Here are our sweet sweet Recommended Playsets with awesome suggestions for different player counts, styles, and difficulty levels! Check out the crew from Cowchop Gaming as they play Two Rooms and a Boom! Should we offer bonus merch and content to subscribers? Sean and Alan discuss whether or not to offer Patreon subscriptions. T-shirts? Custom characters? What else? Also, Captain Chestbeard takes a knave captive, so we knight him. Necroboomicon, the first expansion for Two Rooms and a Boom is now for sale on Amazon for only $6. Necroboomicon is Two Rooms and a Boom on Hard Mode. What does that mean, exactly? Necroboomicon: the first expansion for Two Rooms and a Boom is Live on Kickstarter! Two Rooms and a Boom back in stock! That's right! After the longest wait ever, Two Rooms and a Boom is back in stock on Amazon! This is the beautiful, new and improved second edition. We've got slight upgrades to the quality of the plastic cards, a cardstock upgrade to the Leader Cards and then a host of minor fixes and improvements. It's still got all the great roles and characters from the first/kickstarter edition, so be sure to snag yours today! When Will Two Rooms Be Available? TRY IT NOW FOR FREE! Start playing the game right now! Our awesome Print-n-Play version has always been and always will be totally free. It's available under the Creative Commons license BY–NC–SA 4.0.